With our new group, the John Chappell Natural Philosophy Society, we have some new features to the websites (plural) that should take the group to new levels. First, there are two websites: the main website which is similar to our previous website, and a second website for more “community” based work. CNPS Website Enhancement: Your Own Website! The main site at http://www.naturalphilosophy.org has a new template or look, as well as a feature that will solve a great problem of our last website: personal scientist blogs. A Blog is a Web Log (weBLOG) which is now considered to be a website where individuals or groups write articles that would be interesting for others on the internet. So just think of a blog as a newspaper-like article but is published on the world-wide web. Second, our website is based on WordPress, the most popular website software on the planet. But this new site has a twist: it is a Multisite Wordpress website. This means that individuals can have their own blog website that is based on from the main website. Once logged in, you will see this in the top left-hand corner to get to your personal website or blog. What is even nicer, it solves a great problem we have had in the past: allowing scientists in the CNPS to publish their own articles about their work. Before, we could not do that because there would be too many articles that would get in the way of the main site article. Plus, the majority of the articles from CNPS scientists were about each person’s work and that can turn the general public off, as well as be simply repeating what other scientists in the CNPS know about someone’s work from reading their abstracts and papers. But no more! Now, if you are a paying member of the CNPS, you get your own blog or website to publish whatever you like and the article will appear on the main website as a member’s article. This will be in a separate place from the main articles on the main CNPS website. All those listed in with the own websites have paid their membership or have made a donation to the new organization. So if you have a website there already, take advantage of it! You can find your site in the Dashboard area of WordPress which is on the left-upper side of the website WHEN YOU ARE LOGGED IN. Once logged in, you will see this under the menu item “Sites” in the dashboard area. The community website is based on BuddyPress, a sort of cross between WordPress and Facebook. Therefore, it has groups, forums, and the ability to “befriend” someone so that if they do or say anything, you will be alerted. You can send public messages, private messages, and do full forum conversations without having to worry about being spammed. So please, stop the email conversations and put them into the forums. You will have a bigger audience in the long run for your conversations. VERY IMPORTANT NOTE: You are not automatically a member of the community website. You must register for the community website separately. 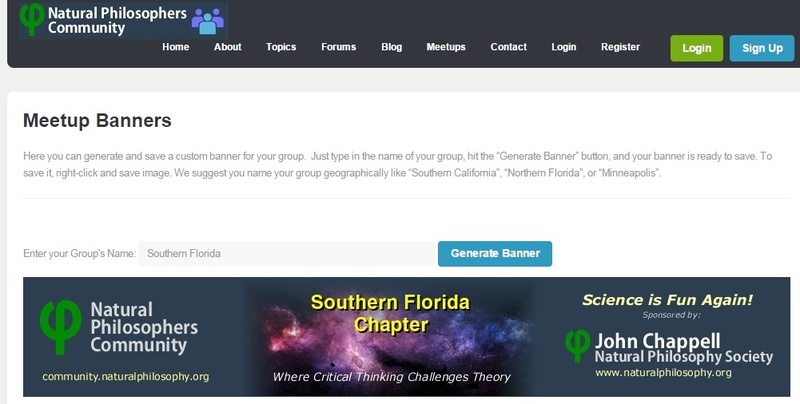 You can auto-generate your web banner for your local Meetup group. If you describe the group correctly, it will attract those who are interested in science and new ideas from the general population. The idea is to get new people, not for only CNPS members to meet. If you need some help learning WordPress, here are some helpful links. Remember: it is the most used website software on the planet so it is well-tested. These are videos that teach WordPress basics and are pretty decent. If needed, I (David de Hilster) could hold a video conference for those wanting to learn how to use everything. In the future, I will be letting people know how to use the “Fundraiser” plugin (professional plugin) to allow scientists to do fundraisers from their CNPS website.